Photo from our School Facebook Page. One of my excitements as an educator is when I hear teachers speak passionately about their learners in positive ways especially about their heritage, language, identity, beliefs or culture. I am even more excited when I hear them make an effort to pronounce their learners home names correctly and notice when their learners have taken on a ‘school name’. I see some cultures embrace this more than others and do not expect their child to take on a school name when they come to our school. I love it when our teachers make an effort to find out how to greet the parents in their home language. This is not an easy task at our school as we have 32 different languages listed as home languages.. This year I have been super excited to see the team I am currently a part of fostering a learning culture that celebrates diversity and inclusion through using a social media ‘WeChat.’ The exciting part of wechat is the simplicity our families have of easily translating what the teacher has written into their own languages. I recently sat Google Educator Level 1 exam and passed. However during my study time, I discovered how easily our families can translate the newsletters into their own language if we also offered a Doc option and not just a PDF. Therefore I will highlight this important feature to my school. One key strategy I use when I teach is providing opportunities to build on a learner’s home language and culture in the learning setting. You can read more about these strategies in mine and Pam’s Book, SOLO Taxaonomy and English Language Learners. I also allow our learners the ability to access their home language when using their chrome books. We have just updated our device management system and I noticed that this feature was locked down so I will be unlocking this again for our learners. One of our support staff takes a group of senior students who are literate in their first language and she creates Duality maps with them. This ensures that heritage, language, identity, beliefs and culture is shared in both languages so that the students can celebrate who they are with their class mates and teachers. This is such an important learning activity that I ensure that time is given to this on a regular basis. You can see some samples here in our newsletter. Check out: 3 July 2017. I myself model learning about histories, heritage, language, identity, beliefs and culture of my learners and what is important to them by continually learning. I am reminded of my TeachNZ sabbatical where I visited 13 countries in 11 targeting the countries where most of our learners come from. Recently I have been learning Chinese so that again I can feel what it is like to be in our learners shoes. Learning Chinese has taken me to China on three visits and my recent visit was highlighted on the International Exchange and Pathways portal (ILEP). This journey helps me understand that my world views are different from those of my learners and that I am willing to learn what it must be like for them to learn in New Zealand. I am an Across School Leader for ACCoS Kāhui Ako and I use this opportunity in my leadership to affirm and draw on the cultural capital that all learners bring with them to their learning experience by giving teachers in our Across Sector Groups the opportunity of sharing about their diverse learners and families in their schools. I believe in this so much that I have recently invited an ESOL Verifier to come and share to our Kāhui Ako so that this adds voice to the work that I believe in. I really like this video from Rae Siilata speaking about the importance of teachers to recognise learner’s differences and have shared this with some of our staff and remind them that language is central to culture, identity and heritage and that the right to use your own language in learning is an internationally recognised human right. If you want to know more about our professional responsibilities to our learners then you must read the updated Code of Professional Responsibility. This blog was inspired by section 2.3 on Page 13. Last term I reflected on the process of teaching writing. I wanted to be really clear of what I did so I stepped through the process of what I do. This piece of writing is a follow on of a reflection I carried out in March. My year 4s sat the written asTTle test and I followed through the process of marking and moderating alongside their team. I compared my targeted group’s data with their historic data and could identify that the first term intervention made a difference. Hattie cautions when calculating an effect size and especially when using less that 30 students. He highlights the usefulness of ensuring that all students are tested and that scores from the same group of students are compared. I have studied all the year 4 data. Currently we have 34 students over three classes. Of that number, 25 year year 4 students at our school have data carried over from last year into this year. Therefore we have 9 new year 4 students at our school. Of that 25 original group, 11 made progress of 1 sub level and 5 of that 11 worked with me. The ongoing challenge is sustainability. I believe that the students I worked with will continue to make progress and I know they will maintain what they have learnt with me. Soon their class teachers will be contacting families as part of three way conversations and I will be part of this. My learning about data from unpacking the process. I believe it is really important for teachers to track the historic data and I have taught the team I am working with how to do this. They looked at the same period of testing results and compared them across 12 months. When teachers only look at their interim March data and compare it to their October data, this gives a lulled sense of achievement. I now know that the focus needs to shift from March to March data. Then a clearer picture of learning is formed. Like reading, there is definitely a summer slide happening in writing. I can see this when I look at the October data and compare it with March. The holiday slide can be slowed down and I have achieved this when I targeted a group of older children and gave them a school chromebook to write with over the holidays. I will write about that strategy next. My other learning is to focus more on the oral language before writing. Sometimes I believe that as teachers we can be so focussed on written output that other literacies are pushed aside. Just to recap with strategies I used that went well. Start with the data. Show the children their results. Identify the gaps and plan strategies that will support the learner. Provide language based experience and use common school events or shared experiences to write about. Track how many words are written in a session and build a graph of the number over a week’s writing. Craft, craft and recraft. Using SOLO Taxonomy highlight key words that can help lift writing. Help the children reflect on what they have learnt about how to make their writing better. Show the children their progress and celebrate writing milestones with families. This term I have reset a goal. By the end of term 2 I will video the process of using a SOLO Taxonomy Describe Map to make a difference to Learner Outcomes so this can be used as a resource to build teacher capability. Hattie’s research stresses that the greater than (d=0.40) is what makes a difference in class programmes. I read this to surmise that our second language learners should make minimal impact on class programmes. Again it all comes back to the teacher who makes the greatest difference. Teachers trained in second language pedagogies. Teachers who empathise with our second language learners because they themselves have experience of either living in a country other than English or who are learning a second language themselves. An experienced teacher is an experienced teacher. Probably one of my greatest criteria is an empathetic teacher. I know because I am also a language learner. I remind readers of the research of Collier and Thomas whose longitudinal research provides us with a historical way of viewing our second language learners. Their research looks at how long it takes for second language learners to achieve academic success and they say 1-2 years for Basic Interpersonal Communication and then on top of that between 6-8 years of Cognitive Academic Language Proficiency in their second language for evidence to be strong and again it all depends on class programmes. Ideally there should be an emphasis on first language maintenance too and then we would see even greater accelerated progress. So our children are at primary school for 6 years. Therefore if they began at 5 years old in their second language we should see catching up with national standard data by intermediate levels and even secondary school. Yes it takes that long. Again when I see the high gains at years 1 and 2 with teachers telling me that the children are at standards, I usually respond with, “Great now let us see if they hold that when Cognitive Academic demands becomes more evident after three years at school and above. You know, that crazy year 3 dip in writing that appears to be common in most New Zealand schools. In our Community of Learners (ACCoS) I am extremely excited because finally I will get the chance to see if the results from Thomas and Collier pan out. I have had snippets from past second language learners who began with no English and who have gone on to take away their school prizes in literacy at high school. I have often wondered how our other children do. Unfortunately in our CoL we will only be able to see our girls achievement at secondary school but can still make smart guesses about our boys. A class teacher would find the challenges of having a dominant mix of ethnicities and a vast variety of English Language Proficiencies extremely challenging. However a proficient teacher will search for ways to cater for all their students. Unfortunately there is no quick fix, iPad app, computer programme, ILE or writing strategy to ‘fix’ this. Only time and an unwavering belief that our children will succeed and we all need to be pushing them along. I have been working with a group of English second language learners in writing. This is what I do to support them. Most of the children have English as a second language. However I also target anyone who needs support at the same level. I thought I would write about the process I undertake so that others might find it useful. I stress here that the best support is ideally within the class programme. But sometimes for intervention the spread happens across several classes within a team. I work alongside teachers so that the writing emphasis is similar to what takes place in class and the children remaining in class are also writing. The last thing language learners need is withdrawal and missing out on class programmes. They are already late to the starting line and we do not want to push this starting line back further. The children I have selected for this piece of reflection are all year 4s. They are mostly boys but Hattie has reminded me that a boys focus only accounts for a (d=0.08) improvement. Most are second language learners but again Hattie has indicated that this makes (d=0.11) difference to what I do. Last year as year 3s, they sat at 1P for writing and so are below. However most were at for writing in year 2. Last year their reading was at for year 3. So as an experience Second Language Teacher and one who uses SOLO Taxonomy to frame what I do, I will use research (meta-analyses) ranking the influence of different strategies on student achievements (Hattie 2009, 2011, 2015) to explain the strategies that I have chosen. Hattie suggests that the following influences will help make the greatest difference in student achievement. Cognitive Task Analysis (d=0.87) using SOLO Taxonomy to identify where the task sits on Cummins Task Difficulty. Opportunity for class discussion (d=0.82) and what we know about privileging opportunities for students to speak. Meta Cognitive Strategies (d=0.53) using SOLO Taxonomy and Second Language Learners because I have coauthored a book with Pam Hook about the process of learning framed with SOLO. Concept Mapping (d=0.64) using Hooked on thinking Maps because they are research based and framed using SOLO. Small Group Learning d=0.47) using targeted intervention for writing such as the SOLO Taxonomy list of writing words identified in SOLO Taxonomy and Second Language Learners. Parental Involvement (d=0.49) by making contact with families through a phone call and have one piece of writing each published in the school newsletter this term. Self Questioning (d=0.64) using, ‘What am I learning? How is it going? What do I do next?’ as a daily beginning for each lesson used from Hook. The first thing I always do is look at the children’s historic data both in reading and writing. I did this for my targeted learners using our Student Management System, Edge. First I located last years writing data in PDF format and printed this off for the children. I had them look closely at their data and highlight where they sat against National Standards. Then using a different colour they highlighted areas that required improvement. For my current group they all highlighted planning and structure. Often I see planning lagging right across all year levels and structure from about year 4 and older. Next we scaffolded what planning is, looks like and how to do this. So together we created a group map using SOLO Taxonomy Hexagons to list our ideas. Together we grouped our ideas and came up with sub titles for the groups. For this purpose I used colour post-it notes. After that I took a photo of the Concept Map and gave each child a copy to use for their writing. We constructed the success criteria with an emphasis of ticking off any ideas we used in writing. Finally the children used their individual photo of the co-constructed map to write from. Just before they wrote they numbered the subtitles to help with structuring their writing. I gave them a 20 minute timed task and recorded how many words they wrote in 20 minutes. that not enough writing was generated in the short time. in addition very few relational SOLO Taxonomy written words were used. For the second piece of writing, again I used a shared experience and had the children create their own describe map using the previous subtitled words they had identified. They were given 5 minutes to plan and again 20 minutes to write. However for this session I realised I was missing the discussion part. Hattie’s elements identified that classroom discussion accounts for an effect size of (d=0.82) so have added this to elements to focus on. In addition using Cummins continuum I realised that what I was asking from the children was cognitively demanding and was context reduced because I did not provide enough support either visually or with front loading. When the children finished the writing using a pencil, they transferred their work digitally to their Google Accounts and added more. Immediately I saw a doubling of written words in a very short time. Now in planning for the third week of writing I will now include. Ensure that the task is cognitively demanding and content embedded. For this week I will also include a co-constructed Hooked SOLO rubric because by now the children are developing a sense of the planning process. From previous experience I also know that the rubric contributes to the cognitive strategies by allowing self reflection using evidence base in what the children can see in their writing. I still need to slow down the writing process but not loose sight of accelerated progress. I continually try and speed up the process. I can continue to give oral feedback and follow up with a written comment. I want to use digital tools for the total process to see if this makes a difference to the volume. My only challenge is using google draw for planning and the children cannot tick off their plan. I wonder if I should trial presentations for the writing process because the planning tools can be manipulated better than in draw and docs. Unfortunately presentations does not have the word count feature which I really like to visually motivate the children. By stepping through what I do using this think aloud reflection, I can identify my strategy gaps in what I did with my learners. The main was was giving a cognitively demanding task but with little support or the opportunity for discussion. I cannot emphasise enough the importance of using shared language experiences for writing. How often do we dismiss these for writing prompts because we do the same activity every year or every term. However by utilising annual or termly school wide activities in writing we develop a resource of snapshots in time and if the children are curating their work digitally we should be able to see a development in their writing using the same prompt. Make a connection with families. I kind of do this anyway but really need to lift my game and make this visual by tracking when I do this. I did this really well two years ago and need to revisit those home connection strategies. My group will soon carry out their written asTTle test and I like to follow this process with marking and moderating alongside their team. I will compare their data with their historic data and see how much this first term intervention has made a difference. For a couple of the students I also want to follow up with their reading data because I am not as confident that they will sustain the levels they were placed at the end of last year. Using probe will confirm or dispute this assumption. In addition I really want to dig deeper with our year 6 national standards data. When I track some of our ESOL learners who have been with us for three years I can see they have met after three years at school standard. But against national standards their data is well below. Looking at it a different way. They came with no English and then after three years at our school, they met after three years at school standard. Personally I confirm this as accelerated progress. What do you think? Are they failing? If you want to know more about the process of writing with ESOL children then you cannot go wrong with SOLO Taxonomy and English Language Learners: Making second language learning visible. Personally I cannot recommend this resource enough and not just because my name is also on the cover but because it is applicable for any writing programme. Harris, A., & Goodall, J. (2008). Do parents know they matter? Engaging all parents in learning. Educational Research, 50(3), 277-289. Hook, P., & Van Schaijik, S. (2016). SOLO taxonomy and English language learners: making second language learning visible. Laughton, United Kingdom: Essential Resources. What is SOLO Taxonomy? SOLO is the Sustained Observation of Learning Outcomes. I was first introduced to this learning framework during my TESSOL diploma in 1997. I selected to present the work of Biggs and Collier during one of my earliest assignments. We had to present our learning in 5 minutes. A decade later I joined Newmarket School and the school was in the second year of an ICTPD contract with Pam Hook. I was incredibly lucky in my second year to oversee the contract therefore was able to have extra learning time with Pam. My understanding of SOLO was reactivated as we learnt how to use the HOT frames and rubrics. I used the HookEd maps from Pam to identify where I was on my learning with using ICT with my students. Those who know me know that I am a technology geek and pride myself on getting fabulous work when I am working with children. When I used the frames to self asses where I was and what my next steps would be, I was shocked to learn that my outcomes were multistructural. In focusing on the product and what could be seen, I totally missed the process and reflection from my learners. So I made it a mission to plug this gap in my learning. Over the next year, I read around SOLO. I cyber stalked the work of Pam Hook. I reread the theory behind SOLO. I reread John Biggs and even talked to him via email. On twitter I started to identify teachers who were using SOLO and devouring everything I could. As I followed teachers particularly from overseas I could see the HookED SOLO Taxonomy maps and symbols in all that they were doing and all this led back to the work of Pam. In gathering the overview for our school about SOLO I quickly identified who the strong teacher users were and one was Virginia Kung. I targeted Ginny for discussion and kept hounding her for feedback. Some of my best outcomes from children were framed using SOLO. Ginny would come in and observe and give me feedback. At the beginning of every session her first question was, ” Show me your rubric.” In my earlier teaching sessions I did not understand the importance of using the rubrics. Ginny still observes me and still has discussions with me and she still says at the beginning of every session, “Show me your rubric.” What the rubric does is clarify what you are looking for with your learners. It allows you to see the progression of your teaching. It highlights key words that jump out and if the children highlight these in their process and reflections and this helps drive identifying next steps and reflecting about what went went well. That learning has finally sunk in. I now always start with the rubric. In addition, if I am writing with the children, I have learnt to have a go first at writing out what I want to see from them. A good example of this is explaining what whānaungatanga is. First I would define whānaungatanga, then describe what it looks like at Newmarket School and make a list of school events that highlight the concept of whānaungatanga. Next I would explain what whānaungatanga means and then if we had an event that brought our school community together, I would evaluate if whānaungatanga was present and maybe identify what we needed to do next time to make the event even better at bringing people together to collaborate, share and celebrate. In the earlier days I was hooked on using the HookED Hot maps. I pulled them all out, and displayed them on one wall of my teaching space. I aligned all the rubrics underneath them, stood back and tried to make sense of it all. Often early users get stuck on the defining and even the describing maps and cannot see past this part of SOLO. But by targeting a new map each term and learning how it works with the rubric, this drove my learning. For example I targeted the compare and contrast HOT map and used this to frame speech writing, Then I targeted analogy maps for creating new monsters that visited our school. I targeted the sequence map to frame a unit on electricity. Each time I pushed for reflections using teacher generated Rubrics. I then carried out a writing session using paddle crabs and I used describe maps and sequencing together and this is when I began to highlight the key words. Reflections and extended abstract thinking. Each time I targeted a new map I kept up the dialogue with Ginny. Over time whenever I saw Pam, I would share with her what I was doing and she would also stretch my thinking by asking probing questions about what I was doing. I looked forward to her visits because it was like self talk. As I reflected more on the process and I clarified my thinking, I could motivate my learners to do the same. I used an explanation map to deepen my own understanding of Matariki. When I worked with the children I pushed for an overall statement. But at that time I still did not see the triangulation of a statement reflecting on the process and sharing where to next. Last year I had Virginia as my appraiser. I deliberately asked for her for two reasons. Ginny can drive my thinking deeper and she always asks for visible evidence. That visible evidence is something I also drive with our teachers. This is my ongoing personal teacher inquiry. ‘If I cannot see what you do, it doesn’t exist.‘ I have been pushing our teachers in curating their own learning via presentations, blog reflections, photo curation via Instagram, google and and micro blogging via twitter. As their skills develop, I also aim to see more learning happening using video. Our teachers’ own learning must be visible for a shift in pedagogy to happen. It is no longer enough to just have learning visible on classroom walls or sitting inside an appraisal folder. My own student inquiry centred around SOLO taxonomy and my TESSOL training. Ginny being who she is asked me to prove the following statement and of course by now I knew to begin with the rubric. presented my inquiry to our Board of Trustees. kept up the dialogue with Ginny. I planned and co-wrote a book with Pam Hook. The initial idea freaked me out because those of you who know me well know how incredibly challenging I find writing and I am the first one to admit that I cannot spell. However I am always up for a challenge. I have never let my spelling skills hold me back. I always find a person with an eye for detail to help me by proof reading what I write. Pam framed up the book and I brought in our Newmarket School samples. Doing something on this scale allowed me to continually reflect on my pedagogy and to test ideas using research. Over the year I read what Pam framed up and I added statements, quotes and some references. We used Google Docs to work collaboratively. As I checked our Doc’s history I could see Pam beaver away continuously in the background. She did an amazing work on research and I am truly thankful at how special the writing has turned out. I can hear my voice as I continually stressed to her that everything I did with our children was not at the expense of their first language. We met once a term face to face over scrambled eggs and bacon and kind of debriefed. Those sessions helped motivate me to plan what I would do in the following term with our learners. During the final few months I gave Ginny and Wendy, our principal access to the doc and asked them for feedback. Even during the final edit we were all still making modifications. During the process it was incredible exciting. Writing a book is like studying. Some of my best teaching happened when I was a TESSOL student. I liken this to research and practice all wrapped up together. So it is like addressing the why and the how of learning. I also knew the importance of gaining my principal Dr Wendy Kofoed and our Board of Trustees approval before undertaking something that involved our school, our teachers and our children. Wendy is so infectious when she says yes. Getting her approval helped spur me into action. As for our BoT, they asked me heaps of questions about my learning when I presented to them. Both gave approval. I especially knew the importance of copyright and gained written parent permission to use their children’s image and work in the book. I had the letter translated into the three main home languages of our school. I learned that something like this is not a one person wonder but involves so many people. Even the product itself had a team of proofreaders, editors, designers and our publisher, Essential Resources. Personally I adore the cover and wished I could have had all our languages on it. But I am quietly happy to see our Pacific greetings take pride of place amongst the other dominant languages that are ESOL funded by our Ministry of Education. I am cautious to thank anyone publicly by name and the important ones are already in the book. But I cannot finish without again thanking the amazing children that I teach and who teach me everyday. However I do have to finish by mentioning my two sisters. Kathie Phipps and Astrid Grobben. You know why and you know what you do for me. Your blunt honesty keeps me on track. In this post I want to thank Pam Hook too for giving me this amazing opportunity to share my practice in such a public way. On Friday Pam and I have our book launch and this happens at our #NPSFab Newmarket School. We have not bought in any books to sell because the afternoon is really a celebration for us. However if you do want a copy, then here is the link on Essential Resources. You have the chance of purchasing both a print copy and an electronic copy. The electronic copy is totally in colour so looks especially amazing. The paper copy is in black and white and that smells and feels amazing. This year my inquiry centres more around my pedagogy and what exactly do I do that makes a difference. Of course SOLO Taxonomy is in there guiding me and of course Ginny is there prodding me. Pam is there too to hold a mirror to my practice. I wonder if there are holes in the bucket? Phonological awareness refers to an individual’s awareness of the phonological structure, or sound structure, of words. TKI defines phonemic awareness as the ability to hear, differentiate, and attend to the individual sounds or phonemes within words and is part of phonological awareness. Alcock further states that ‘Phonemic awareness is a category of phonological awareness and is the ability to hear, identify and manipulate individual sounds in words. Phonemic awareness is necessary for understanding and using phonics knowledge.’ Alcock, 2010. Gillon (2004), stresses that, “Phoneme awareness performance is a strong predictor of long-term reading and spelling success and can predict literacy performance more accurately than variables such as intelligence, vocabulary knowledge, and socioeconomic status” (p. 57). Many people do not understand the difference between phonological awareness, phonemic awareness, and phonics. Others are uncertain about the relationship between phonological awareness and early reading. I created the following diagram from our teacher only day to help clarify my thinking. You can see that phonics are visual and phonological awareness is all about listening. Phonemes are a subset of phonological awareness. Phonological awareness is an important and reliable predictor of later reading ability. Some of the most exciting findings from research on phonological awareness is that critical levels of phonological awareness can be developed through carefully planned instruction therefore having major influence on children’s reading and spelling achievement. This week we had our team meeting with Andrea our fabulous team leader who had asked Lynne one of our RTLiTs to come in and do a follow up session of Phonological awareness that she had run for staff on our teacher only day. Andrea had been so inspired by the concept of checking the foundation of literacy using the phonological awareness assessment that she had run the phase one test with her 5 year old class. She had been motivated by the patterns she had identified. She thought phonological awareness is something we should all seriously look at. After our team session I totally agree with her. I reflected on my inquiry regarding 3 level guides and wondered if I was working with leaking buckets of knowledge. So I asked Lynne if she could carry out a phonological awareness test with one of my students whose data did not make sense. I wanted to observe how she carried out the test so I could continue when I had similar doubts with some of the data I gathered. I also wondered about using it to gather further data before I began my writing intervention. Lynne used the Plymouth Phonological Awareness Assessment Phase One. One of my target students is a year 6 second language learner. He has been with us since he was nearly 7 and I know he did not achieve literacy in his first language. Those of you who work with bilingual students know about the phenomena that happens when children are literate in their first language and how fast they can accelerate when learning their second language. This student is at level 17 for reading. He is well below for writing. He was recently tested using Steps and identified as achieving well below his chronological age. I reflected on our overall school literacy programmes. For example, I run an ESOL programme and intervene with children who need accelerated work to catch up to the moving target of peers that they are chasing. We run a ‘Steps’ programme that works with children who appear to have gaps in literacy building blocks. We gather data for the Mutukaroa cluster project that we are part of. We have reading recovery for children identified at 6 years old observation survey who do not appear to make the required progress. Often the programme spaces are taken up with our second language learners. In addition we sometimes run an accelerated literacy programme for our gifted and talented children. This year as a school we have targeted writing and especially targeted SOLO Taxonomy as the framework for writing because this has been identified as helping children to deepen their literacy. We have put more of staff resourcing to support learning in class because international research has identified that withdrawal is the least effective form of literacy development. Our teams are currently trialling grouping students according to needs as teachers experiment with their own learning pedagogies. This is a cautious approach because we are also aware of the research around grouping children. As a school we are really good now at gathering data. Teams are beginning to develop an awareness that our children’s data is all of our responsibility. Data is an ethical issue. As a school we are all responsible if our children are not making the required progress. Therefore I believe that along with making connections with the child and their families we also should check the bucket of literacy learning. When children are literate in their first language we should see accelerated progress. If they are not literate in their first language, then we should endeavor to ensure language maintenance continues. Before we pour in the learning, check that the foundation of literacy is in place. The Phonological Awareness Assessment is simple to administer and yet can quickly identify gaps that need addressing. I begin a new writing group this week. Before I do anything, I have looked at their data and identified where they are reading at. I have looked at their e_asTTle writing data from last year. I have looked at their historic data and found out as much as I can about the children. I will now carry out a Phonological Awareness Assessment and check their foundation and feed this back to their teachers. This week our children are sitting an e-asTTle test and I will mark and collate my group’s data. I will be part of our team moderation and then our school wide moderation. Taking part in moderation ensures that my own teacher judgements remain current with national standards. As a teacher of children learning English I believe it is important to find out as much as I can about the children I teach. I believe it is important to address the urgency of second language learners catching a moving target of learners. But not at the expense of maintaining their first language. I believe it is especially important to make connections with the children that I teach. One way of doing this is just getting to know the children personally. I do this by targeting them in the playground and saying hello in their first language. I often make links with them via a common interest. At the moment a big interest with children is Minecraft. With some of the older girls, it is drawing using the Manga style- (Big Eyes). My last question for anyone reading this is…. Gillon, G. (2004). Phonological awareness: from research to practice. New York: Guilford Press. I am always up for a challenge and there is no one like my mentor to give me the push I need to reflect and think through pedagogy. Just before the end of the year, I always go through the end of the year class data and identify my English Language Learners who could slide in reading over the summer period. Therefore over the summer period I give them a bag of books with the understanding that I will test them when they come back to school and I expect them to have either maintained their level or moved up one level depending on where they sit on the PM benchmark or using early probe levels. This week from testing the children after the summer holidays I have several year 4 and 5 children at turquoise level on the PM Benchmark. So we are looking at level 17-18. Those of you who understand our system here in New Zealand will know that this is well below where they are expected to be by year 4 & 5. Have a think about this piece of information. Many of our ELL children came to us two years ago with no English. Therefore against our system that is the progress they have made within two years beginning with no English. If we look at our data and our school standards level 17 and 18 is the benchmark that we aim for for children after two years at school. In addition these children have achieved that benchmark and often began with no English. Therefore are they ‘failing’? Linguistically they have made accelerated progress because they have had to go through the silent, watching period and then learn basic interpersonal communication skills so they can communicate with peers and now they are beginning to gain cognitively applied language proficiency as we start the next process of developing inferential skills in reading. They have caught up over two years what a first language learner achieves after 7 years old. Pretty amazing and always makes me proud. From the recent testing analysis I have identified that at the text level or the surface level of reading, their decoding skills have improved markedly from last year with a 95+ % result. However the analysis identifies that they could do with help unpacking between the text and beyond the text comprehension strategies. Those comprehension questions continually trip them up at inferential level and stop them moving up to the next reading level. Those of you who are ESOL teachers will probably know the work of Herber (1978) who devised a comprehension strategy known as ‘The three level guide’. This comprehension strategy is a pre/post reading activity that gives students the opportunity to evaluate information at the literal, interpretive and applied levels based on a reading selection. The comprehension strategy was developed further by Morris and Stewart-Dore (1984) to help students think through the information in texts. Myself I have trawled our fabulous TKI ESOL site to revisit ESOL comprehension strategies that I learnt about during my Diploma of TESSOL with Sue Gray and team. Furthermore this time I have used my SOLO Taxonomy hat to unpack the information using an information transfer chart. I have created 3 level guides in the past and have used them with great success.. However over the past few years I have been focussing on writing with my English Language Learners as this is another area that continually needs support. Three level guides means just that 3 levels of comprehension. The comprehension strategy has teacher created statements that occur with searching for information at surface level of text, then has between the text statements that the reader applies the information from the text to real life contexts and explains reasons for this in paired or group discussion and then finally it has beyond the limits of the text statements that the reader critically evaluates the information and relates it to what is already known and justify their answers and their views. Using SOLO I have identified exactly where each level sits and why but from the writing research I have recently carried out I know that unistructural level in SOLO Taxonomy is also a really important level to go through and this does not feature in three level guides. The three level guide sits comfortably at multistructural, relational and extended abstract. I now know that is why I have alway found them extremely effective in teaching inferential skills. Therefore as I have unpacked the guides against SOLO I have identified the unistructural part. That is reading or decoding the text. Our ELL are fabulous at that. Decoding is especially noticeable when they are literate in their first language. They fly through the PMs and then when inferential really kicks in at level 17 and 18 they plateau. Often I observe the data and see them sitting at this level for far too long. Several ELL can sit there in class for a year. Personally I believe this is not good enough and we are undervaluing what can be done to push them forward and especially if they are to match their peers after 6 years at school in New Zealand. Therefore for this first term I will provide explicit teaching and feedback using three level guides in order to scaffold my English language learners to develop reading strategies. I want them to be able to infer from text and think critically independently. By doing this I expect a shift up of one level over this term. Personally I will aim for two levels but I know from past experience if I push too hard then they sit at the next level for three terms. I have begun the first step by identifying the gap in their learning. I have gathered my data through carrying out reading analysis using running records. I have looked at their historic data and have identified that they have been sitting at level 17-18 for longer than they should have. I have identified that decoding skills are strong so can move straight to multistructural discussion by looking for information in the text. They can retell the story as this is another early indicator of understanding. In SOLO Taxonomy retell is at relational thinking as this demonstrates an understanding of sequencing and progression. For the clarity of this intervention I will look at sequence from a unistructural perspective and think of it as listing progression in the text. In SOLO before I even begin to teach comprehension I need to identify where the learners are at. One way of doing this is sharing with them their comprehension data or their latest running record. So with my support they can begin to define what comprehension is and list the difference it can make to their reading. Once done, I begin the Three Level guide strategy. So the students are using one comprehension strategy. The learner can decode the text and retell the text simply by listing the order of events. At the surface level the learner finds the answer to literal questions on the page and point to them. This is looking at surface level of comprehension. At this level the learner can decode the text, retell what they read and find literal answers on the page by pointing to them. At between the text, the learners will be paired into similar levels and they will interpret what the writer is saying by discussing their answers of what is between the text. They will do this by interpreting and applying the information from the text to real life contexts. They could use a variety of relational thinking such as compare and contrast, analysing, part whole thinking, classifying, cause and effect or even analogy. At beyond the text the learner critically evaluates the information and relates it to what is already known.They will explain their answers and justify their views and come up with a single overall statement. I like the I wonder statements and so will begin with these ones. At the end of each article the children will identify their next steps by using SOLO Taxonomy rubric to reflect on their growing understanding of inferencing. Using a follow up test I will see the difference that this intervention makes. I am really lucky at Newmarket School because the teachers who have these children are into their second year of researching and teaching using innovative learning pedagogy. we also have teachers who are enthusiastic at what I achieve with the children and regularly query my methods therefore I have been able to articulate clearly what I do in a visible way. In addition I have a mentor who gives me clear feedback and regularly prods my thinking so that I am always ready with research and data. If I am not then I say so. By having these regular minor learning discussions I have grown confidently in my pedagogy. I have also been thinking about February’s #EdBlogNZ challenge of creating a photo of my learning space. I have begun by setting up my SOLO Taxonomy writing wall. If you want a copy of the words then look out for SOLO Taxonomy and English Language Learners available very soon from Educational Resources. Pam and I are very proud of our collaborative book. If you want the SOLO Taxonomy postcards then these are available from http://shop.pamhook.com/. My ongoing goal is to make learning visible and SOLO Taxonomy is fabulous for doing this. I usually create ‘messy’ walls because they help me think and reflect on my pedagogy. I will complete my reading wall now that I am really clear on what it looks like. Update: My mentor mentioned I had omitted prestructural in my thinking. Therefore I have added that. (that is me thinking I do not really need to be adding that.) However presrtuctural is also an important part of thinking. Herber, H. (1978). Teaching Reading in the Content Areas. New Jersey: Prentice Hall. Hook, P., and Van Schaijik, S. (in press). SOLO Taxonomy and English Language Learners. 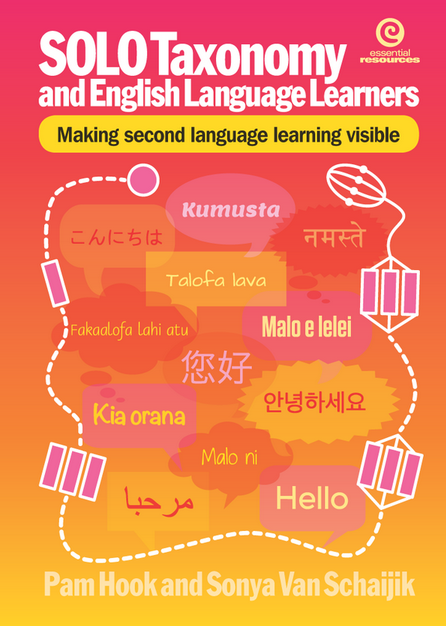 Making second language learning visible. Essential Resources Educational Publishers Limited. New Zealand. Morris, A. and Stewart-Dore, N. (1984). Learning to Learn from Text: Effective Reading in Content Areas. New South Wales: Addison-Wesley.